The Food and Drug Administration (FDA) defines a “biosimilar” agent as a biologic that is highly similar to the reference or originator biologic product notwithstanding minor differences in clinically inactive components with no clinically meaningful differences in terms of the safety, purity, and potency. The advantage of biosimilars is that they are usually about 15%–30% less expensive than the reference product, which results in system-wide cost savings and increased patient access. Because biologic drugs are produced by living organisms, they are by nature heterogeneous and identical copies cannot be made, unlike generic versions of small-molecule drugs. Proposed biosimilars must undergo a rigorous evaluation process to demonstrate a high degree of structural and functional similarity with the reference biologic. Once that is confirmed, a stepwise process of comparison with the reference agent with regard to animal trials, pharmacokinetics/pharmacodynamics, immunogenicity, and human efficacy/safety is conducted. The experience with biosimilars in other highly regulated markets where patent protection for originator biologics is not as robust as in the United States has been favorable in terms of safety, efficacy, and cost savings. An FDA approval pathway was created in 2009 to expedite the approval of biosimilars; as of early 2018 nine agents had been approved through that pathway, none in nephrology. The first United States biosimilar epoetin was approved on May 15, 2018, but does not have an interchangeability designation, meaning that prescribers must specifically write for the biosimilar product for patients to receive it. Given the unfamiliarity of biosimilars within the nephrology community it is recommended that educational programs be developed to address this unmet need and for research to be conducted addressing the perceptual, clinical, and economic effect of biosimilars on our patients. A “biological product” is defined by the Food and Drug Administration (FDA) as a “virus, therapeutic serum, toxin, antitoxin, blood, blood component or derivative, allergenic product, protein (except any chemically synthesized polypeptide), or analogous product … applicable to the prevention, treatment of cure of a disease or condition of human beings.” (1) Indications for currently available biologic drugs include cell therapy for cancer; clotting factors for hemophilia; cytokine or growth factors for cancer and hepatitis C; enzymes for hereditary deficiencies; mAb for arthritis, lupus, psoriasis, inflammatory bowel disease, multiple sclerosis, and cancer; polyclonal antibodies for immunodeficiency; toxins for cosmetic use; hormones; and vaccines for influenza and other viruses (2). Most recognizable to nephrologists is the biologic recombinant human erythropoietin (rHuEPO). Considerably more expensive to develop and produce, biologics are more structurally complex than small-molecule drugs. By 2020, biologics will constitute an estimated 27% of spending on worldwide pharmacologics (3). The top three drugs (on the basis of cost) administered to out-patients in the United States during the first 9 months of 2014 were infliximab, pegfilgrastim, and erythropoietin (4). Because of the high cost of biologics, fewer people may have access to these agents, limiting their benefit and use. A “biosimilar” agent is defined by the FDA as a biologic that is highly similar to the reference or originator product, with no clinically meaningful differences in terms of the safety, purity, and potency regardless of minor differences in clinically inactive components (1). It is incorrect to use “biosimilar” to characterize any “copy” or replica of a biologic drug whose target is the same as the reference agent, especially copies developed for markets such as Asia, Africa, and Central and South America that are not highly regulated and for which the agent has no proven comparability to the reference drug. Because many countries in these regions do not have a rigorous process for the testing and approval of so-called “biosimilar” agents, the lesser quality and adverse outcomes reported have made many health care providers and regulators skeptical about the safety and efficacy of “biosimilar” agents in general. The term “biosimilar” is correctly attributed to agents approved in highly regulated markets such as the European Union (EU), the United States, Canada, Japan, Australia, and New Zealand. These products must meet strict criteria of quality and comparability to their respective reference biologics; after approval in highly regulated markets, the record of safety and cost savings is encouraging (5). Because patent protection for originator pharmaceutics is of shorter duration in the EU than the United States, the EU has a longer experience with the approval process and monitoring the safety of biosimilars that dates to 2005. The first biosimilar epoetins were approved in the EU in 2008. The EU’s experience with biosimilars demonstrated cost savings and expansion of patient access without negative effects on patient outcomes, because consistent and appropriate scientific regulatory standards were applied to biosimilars exactly as they are applied to the reference biologics. In 2010, the European Generic Medicines Association reported savings of 1.4 billion euros per year for European health care systems because of the use of biosimilar agents (6). It is forecast that the use of biosimilar agents will lead to savings of 11.8–33.4 billion euros in France, Germany, Italy, Poland, Romania, Spain, France, and the United Kingdom by 2020 (7). On the basis of the benefits realized in Europe, the United States implemented the Biologics Price Competition and Innovation Act (BPCIA) in 2009 to clarify and expedite the approval process for biosimilar agents. Although not as considerable as the cost saving seen with generic small-molecule drugs (which averages 77% in the first year ), the Federal Trade Commission anticipated that the availability of biosimilars would significantly reduce the cost of biologics and increase their accessibility (8). Although supporting data are not robust, biosimilars approved in the United States and EU to date have afforded modest cost savings of 15%–30% over their reference agents (9). With originator products lowering their prices to compete with biosimilars, savings may eventually be larger. Biologic drugs vary in size from simple replacement hormones to large complex molecules with extensive post-translational modifications, such as mAb. Advances such as improving process efficiencies, increasing output to meet expanded commercial demand, and taking advantage of process efficiencies result in minor modifications in the manufacturing, packaging, and distribution process (10). The FDA requires manufacturers to demonstrate that production changes do not adversely affect biologic drugs’ identity, strength, quality, purity, or potency. Therefore, comparability testing is performed through appropriate analytic testing, functional assays, and, in some cases, animal and/or clinical studies. Comparability testing proves comparability and allows production changes to occur without a completely new product development program. Establishing biosimilarity of an agent by another manufacturer is a form of comparability assessment and the scientific concept is identical. However, demonstrating that a proposed product is biosimilar to a reference product is more complex than assessing comparability of a product before and after a manufacturing change by the same producer; development of a biosimilar product will likely result in a different manufacturing process, because no direct knowledge of the manufacturing procedures for the reference agent is available to the biosimilar developer. Thus, more data and information are required to establish biosimilarity than to establish comparability of a biologic product after a manufacturing change (10). Biologic drugs are not homogeneous as are small-molecule drugs. 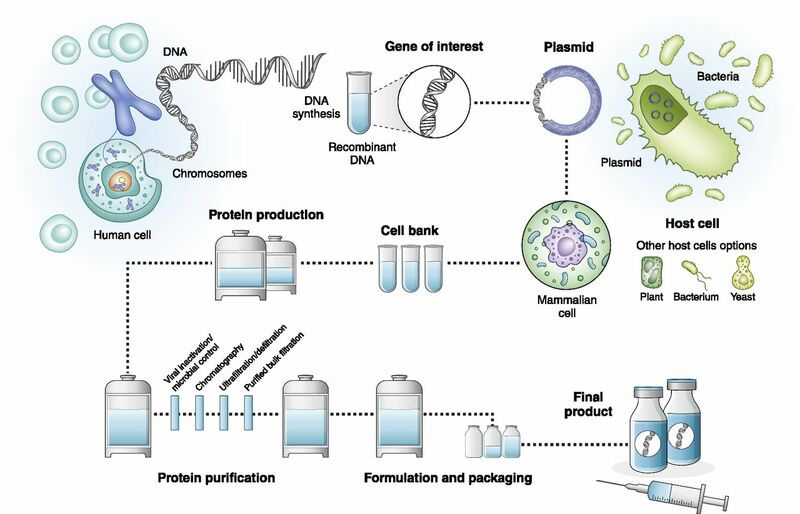 Biologics are produced by cellular systems, which are neither perfect nor consistent by nature and invariably have heterogeneity that results from variability in post-translational processes. This is aggravated by fluctuation from even the highest quality manufacturing, packaging, and distribution processes. Therefore, there can be no perfect copy of a biologic drug, a “bioidentical” drug, because even the originator agent does not contain all perfect, identical molecules. The steps in the manufacturing of biologic (originator and biosimilar) drugs are summarized in Figure 1 (11). The manufacturing of a biologic drug is a highly complex process. Adapted from Mellstedt, Niederwieser, and Ludwig (11), which is available under the terms of the Creative Commons Attribution License. In the United States, two approval tracks for new drugs are available: the “505” pathway established by the Food and Drug Cosmetic Act (new drug application, used for small-molecule drugs and some older biologics approved through this pathway) and the “351” pathway established by the Public Health Service Act (biologic license application, specifically for biologic drugs). In 2009, the United States enacted the BPCIA, which gives the FDA authority to approve a biosimilar drug for which the reference product is a previously licensed biologic approved through the 351 pathway. The BPCIA’s 12-year exclusivity to new biologics means the FDA cannot approve a biosimilar until 12 years after approval of the reference product (12). However, as early as 4 years after the approval of the reference product, the developer of a biosimilar agent may submit a 351 pathway application. Developers of biosimilar products can take advantage of BPCIA’s abbreviated pathway, 351(k), to streamline the approval of biosimilars of reference products that were approved through a full 351(a) biologic license application. The 351(k) pathway is on the basis of the comparability principle described above for a manufacturing change for a biologic agent (13). The process begins with structural and functional comparison between the biosimilar and reference products. Additional testing will be determined on the basis of analysis and differences between the agents; more rigorous analysis and fewer differences between the agents will likely trigger less testing. 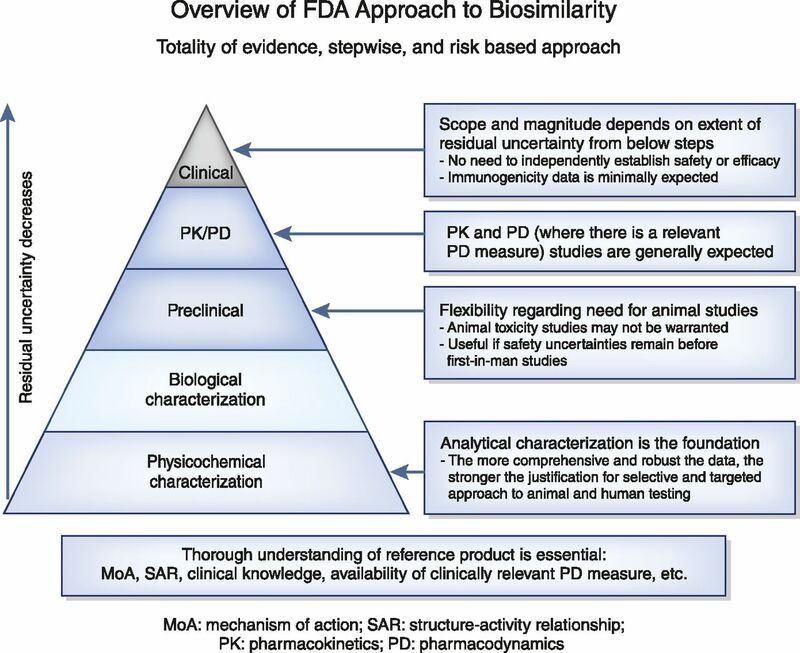 Animal data to determine toxicity, immunogenicity, and pharmacokinetics (PK)/pharmacodynamics may be required to assess safety concerns before human testing of biosimilar products. The congruence of the structural/functional analysis, the knowledge base regarding the reference agent and its safety issues, and any residual concerns from the previous steps will determine the extent of human PK/pharmacodynamics testing needed. Human clinical testing will generally be required but, unless significant lingering concerns persist, there should be minimal requirement to establish safety and efficacy independently for the biosimilar agent. Immunogenicity studies may be required, including assessment of binding antibodies and neutralizing antibodies. The FDA will make its determination regarding approval on the basis of the totality of the evidence (italics added by the FDA) (10,14) (Figure 2). Approval of a biosimilar product is a stepwise process with greatest emphasis on structural and functional similarity to the reference product. Reprinted from reference (14), with permission. Unlike rheumatology, gastroenterology, and oncology, there are relatively few biologics that are routinely used in nephrology. Erythropoietins are the most familiar. The United States patent on eculizumab, which is used to treat atypical hemolytic uremic syndrome and off-label to treat membranoproliferative GN, expires in 2021. Amgen and Boston-based Epirus Biopharmaceuticals are developing biosimilar versions of eculizumab and are expected to file for FDA approval in 2020 (15). The United States patent on rituximab, which is used off-label to treat a number of glomerular diseases, expired in 2016. A proposed biosimilar for rituximab sponsored by Sandoz was accepted for review by the FDA in September of 2017. The Sandoz biosimilar rituximab was approved in the EU in June of 2017 (16). Published data regarding biosimilar rituximab are confined to its use in B-cell lymphomas and rheumatoid arthritis with none in glomerular diseases. A biosimilar version of baziliximab, used for prophylaxis of kidney transplant rejection, is under development in China; without a United States development program it is unlikely to be approved by the FDA (17). The patent on belatacept, also used for prophylaxis of kidney transplant rejection, does not expire until 2024 and no biosimilar versions are currently under development. The status of biosimilar development of these agents and the erythropoietins is summarized in Table 1 (15–18). The United States patent on epoetin alfa, a form of rHuEPO developed by Amgen and introduced in 1989 (19), expired in 2013. Darbepoetin’s EU patent expired in 2016 but its United States patent does not expire until 2024. All rHuEPOs have the same amino acid structure, but rHuEPOs made from different cell lines can differ in their carbohydrate structure which may affect their PK and potency. There are two epoetin biosimilars approved in the EU since 2008 for which there is considerable clinical experience: HX575 and SB309. Both of these agents have undergone clinical trials in the United States in anticipation of submission to the FDA for approval through the 351(k) pathway. Sandoz, the sponsor of HX575 in the United States, markets the agent in the EU under the international nonproprietary name epoetin alfa and trade name Binocrit; Hospira/Pfizer, the sponsor of SB309 in the United States, markets the agent in the EU under the international nonproprietary name epoetin zeta and trade name Retacrit. In late 2017, Sandoz abandoned its United States development program for epoetin alfa, leaving epoetin zeta as the only proposed biosimilar epoetin in the United States. Hospira/Pfizer submitted its FDA application for epoetin zeta under the name epoetin hospira. On June 23, 2017, the FDA issued a complete response letter to the epoetin hospira application citing manufacturing concerns in Pfizer’s fill-finish facility in Kansas (20). The FDA issued final approval for epoetin hospira on May 15, 2018, under the generic name epoetin alfa-epbx and the brand name Retacrit. The epoetin hospira application to the FDA was supported by four human studies summarized in Table 2 (21). Because biologics are proteins that can be recognized as “foreign” by the body, immunogenicity is always a concern with these agents, especially with recombinant erythropoietins which may induce anti-drug antibodies that crossreact with native erythropoietin and lead to pure red cell aplasia (PRCA). A cluster of PRCA cases was identified in the EU between 1998 and 2002 after a manufacturing change with an originator epoetin, Eprex, and which occurred only when the drug was administered subcutaneously (SC). The problem was identified and solved, but it led European health authorities to contraindicate SC administration of Eprex for patients with CKD from 2002 to 2006 (22). Two cases of PRCA occurred when a biosimilar epoetin (Binocrit) in Europe interacted with the tungsten used to manufacture prefilled syringes (23). The problem was quickly identified and solved, but the EU withheld approval for SC Binocrit administration until 2016. These episodes reinforce the fragility of the manufacturing, packaging, and distribution process for biologic agents with regard to immunogenicity, even within highly regulated markets such as the EU. In the less well regulated market of Thailand, Praditpornsilpa et al. (24) noted an alarming increase in the prevalence of PRCA to one in 2068 patients at risk, concomitant with the increased penetration of “biosimilar” epoetins in the market. However, these are not true “biosimilar” products but rather biosimilar-like drugs developed in less regulated markets and the worrisome immunogenicity of the latter should not be confused with the very low immunogenicity of highly regulated products. Patients receiving epoetin hospira in the United States registration trials had comparable low rates (<4%) of anti-drug antibody (non-neutralizing and not affecting drug efficacy) production as those receiving Epogen/Procrit in the control arms. No patient in either arm of any of the United States registration trials for epoetin hospira developed neutralizing antibodies or PRCA (21). Given the relative lack of knowledge regarding biosimilars and a perceived lack of trust by the nephrology community regarding their safety and efficacy, the National Kidney Foundation (NKF) conducted a symposium, Introduction of Biosimilar Therapeutics into Nephrology Practice in the United States, in September of 2015 (25). A number of issues were discussed and are summarized below and in Table 3. It was agreed that each biosimilar agent should have a unique name to distinguish it from other biosimilars and the originator drug, even if the biosimilar has been designated as “interchangeable” with the reference product by the FDA (see below). This is extremely important to minimize inadvertent substitution and for pharmacovigilance, meaning if an adverse reaction should occur it will be easier to trace it back to a specific agent. In 2017 the FDA issued final guidance (26) on the naming of biologics and biosimilars in which a core name is followed by a hyphen and a four-letter suffix in lowercase devoid of meaning. A related biologic or biosimilar product will receive the same core name as the originator. If the core name itself includes a suffix (such as “alfa”), that suffix will be retained before the additional four-letter suffix that identifies the specific product. The FDA assigned the generic name epoetin alfa-epbx to epoetin hospira. As of this writing, a suffix for the originator epoetin alfa has not been assigned. To meet the higher standard of interchangeability for a biosimilar agent, Section 351(k) (4) of the Public Health Service Act (27) requires an applicant to “demonstrate that the biologic product can be expected to produce the same clinical results as the reference product in any given patient and, if the biologic product is administered more than once to an individual, the risk in terms of safety or diminished efficacy of alternating or switching between the use of the biologic product and the reference product is not greater than the risk of using the reference product without such alteration or switch.” The FDA issued draft guidance in January of 2017 to sponsors of biosimilar drugs for demonstrating interchangeability with a reference biologic (28). As of this writing, no biosimilar has been designated interchangeable by the FDA. The sponsors of epoetin hospira did not request interchangeability designation. An FDA designation of interchangeability is not required for a physician’s decision to use a biosimilar or to transition patients from a reference biologic to a biosimilar. Physicians (or other prescribers) may prescribe a biosimilar in the same manner as they would prescribe other medications; the prescriber-directed decision may include prescribing a biosimilar for patients currently stable on the reference biologic (i.e., single transition or switch). A single transition from a reference biologic to a biosimilar may be appropriate on the basis of clinical judgment. The designation of interchangeability provides greater confidence that multiple switches between the reference biologic and biosimilar are safe and also allows for substitution of the biosimilar with the reference agent by the pharmacist within the restrictions described below. The rules governing substitution of a biosimilar for a reference biologic apply only to interchangeable biosimilars (of which there are none as of this writing) and are embodied in the pharmacy regulations of individual states. As of April 2017, 27 states and Puerto Rico enacted laws concerning biosimilars and biosimilar substitution. Most of these laws have features in common: (1) the biosimilar must be designated “interchangeable” by the FDA, (2) the prescriber can prevent the substitution by stating “dispense as written,” (3) the prescriber must be notified of any substitution made by the pharmacy, and (4) the pharmacy must keep a written record of when a biosimilar is substituted for a reference biologic. The NKF workgroup (25) recommended that patients also be informed of a switch between a reference biologic and a biosimilar, irrespective of whether that switch was performed by the prescriber, pharmacy, health insurance plan, hospital, infusion center, or dialysis provider. Extrapolation refers to FDA approval of a biosimilar for an indication for which the biosimilar has not undergone clinical trials but for which the reference product has been approved. Extrapolation to nephrologic disease does not yet apply to any biosimilar agents since the registration trials for epoetin hospira were performed in patients with CKD on hemodialysis. It is conceivable that a future biosimilar will receive a nephrology indication through extrapolation without having performed registration trials in patients with the nephrologic disease. The FDA evaluates extrapolation on the basis of the mechanism of action in each condition for which licensure is sought, the PK and biodistribution of the product in different patient populations, the immunogenicity of the product in different patient populations, differences in expected toxicities in each condition of use and patient population, and any other factor that may affect the safety or efficacy of the product in each condition of use and patient population for which licensure is sought (29). Epoetin hospira performed its United States registration trials in anemic patients undergoing hemodialysis and received FDA approval through extrapolation from Epogen/Procrit for treatment of anemia in all stages of CKD, anemia due to zidovudine in patients with HIV-infection, anemia due to chemotherapy in patients with cancer, and reduction of allogeneic red blood cell transfusions in patients undergoing elective, noncardiac, nonvascular surgery (21). The NKF workgroup (25) agreed that because the concept of biosimilarity is not familiar to most practitioners and patients, a robust educational effort is warranted to inform choices and provide transparency. There may be considerable skepticism regarding the rationale for abandoning a “tried and true” reference product for a biosimilar agent with a limited track record for safety and efficacy merely to provide cost savings that may not accrue to the patient (as in the case of patients with ESKD where the cost of erythropoietins is part of the bundled payment and any savings accrue to the dialysis provider). Educational topics for providers and patients suggested by the NKF workgroup are summarized in Table 3 (25). The NKF workgroup (25) agreed that an initial period of postmarketing surveillance for the safety of newly approved biosimilars in the United States should be in the range of 2–4 years, as adopted in Europe. During this period, it is important that Centers for Medicare and Medicaid Services provide a unique billing code for the biosimilar agent so it can be identified should untoward effects occur within a class of agents. Additional long-term research will be needed to provide support regarding the safety and efficacy of biosimilar agents in general and products in particular (see Table 3) (25). The first biosimilar agent was approved in the United States through the 351(k) pathway in 2015. The FDA approved the first biosimilar epoetin in May 2018 without an interchangeable designation. The adoption of that agent, epoetin hospira (United States brand name Retacrit and generic name epoetin alfa-epbx), will depend largely on decisions by hospitals, infusion centers, pharmacy services, and dialysis providers to promote the use of the biosimilar by substituting it for an originator erythropoietin on its formulary and/or by requiring prior authorization/justification for the use of an originator agent. In any event, because the biosimilar does not have an interchangeable designation, the prescriber must order the biosimilar for it to be administered to the patient. The comfort level that prescribers and patients have with using an unfamiliar biosimilar must be addressed with educational programs regarding the nature of biosimilars and the attributes of the agent in question. It will be important for nephrologists to learn from our counterparts in other specialties who have been using biosimilars for a while. The cost savings for an epoetin biosimilar in patients receiving dialysis will initially accrue to the dialysis providers, but will eventually accrue to the payers such as Centers for Medicare and Medicaid Services as the bundled payment is inevitably rebased. The cost savings for a biosimilar for an agent such as eculizumab, now one of the most expensive drugs in the world, will accrue more directly to patients and will provide access to patients who could not otherwise afford the originator product or its copay. Despite the intent of the BPCIA to accelerate the approval of lower-cost biosimilar agents, United States patients remain at a significant financial disadvantage to their European counterparts because of the longer patent life for originator products in the United States and the inability of United States patients to obtain lower-cost biosimilar agents with a proven safety record from Europe once the patents on the originator products expire in the United States. A patient-centered approach to biosimilar availability in the United States should consider these barriers. Increasing patient access through lower cost is ultimately the promise of biosimilars. No funding was received for the writing of this article. J.B.W. serves as a consultant and is on the speaker bureau for Pfizer. The author is grateful to Deborah Abbott for editorial support.